DK Eyewitness Top 10 Mallorca Travel Guide will lead you straight to the best attractions the island has to offer. Whether you're looking for a hotel to suit your budget, beaches, picture-postcard villages or the best restaurants; this guide is the perfect pocket-sized companion. Rely on dozens of Top 10 lists - from the Top 10 hidden coves to the Top 10 family attractions, there's even a list of the Top 10 things to avoid. 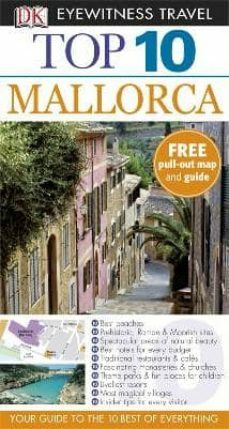 The guide is divided into sections on: Palma, the Southwest Coast, the North Coast, the Southeast Coast, and the central plain; all packed with beautiful illustrations of the island's attractions. You'll find the insider knowledge every visitor needs and explore every corner of Mallorca effortlessly with DK Eyewitness Top 10 Mallorca Travel Guide and its FREE pull-out map.